People sometimes question the ‘relevance’ of museum collections. Right now, the Stirling Smith’s collection is the inspiration for an international anti-gun campaign in the wake of the mass shooting in Las Vegas, 1 October. Black American artist and political activist Ray Noland, who helped Obama’s election campaign in 2008 with his ‘Go tell Mama’ posters, was intrigued by the art of the late George Wyllie (1921-2012) marking the Dunblane massacre in 1996, when 16 children and their teacher were slaughtered by gun crime. 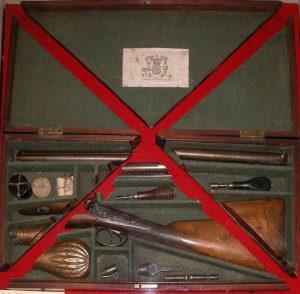 George took a boxed Scottish rifle and cut it into the form of a St Andrew’s cross or saltire, calling his work ‘Breaking the Habit’ in reference to the Scottish campaign against the use of guns. The Smith purchased this work, where it has been on show since 1996. Dunblane’s Snowdrop Campaign was successful in changing gun law. 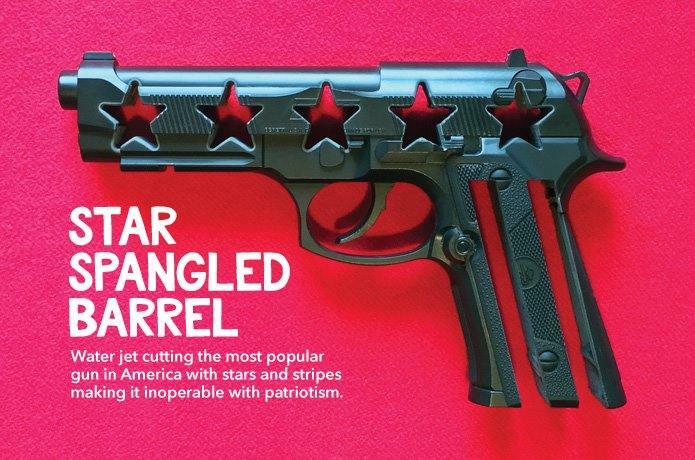 Working from his studio in Berlin, Ray Noland has now created the Star Spangled Barrel, cutting the most popular American gun with the stars and stripes ‘making it inoperable with patriotism’. The campaign is running on line and will move to galleries when the work is progressed. If the Smith collections can help change gun law in the USA, they are surely beyond price. And since the laws were passed in 1996/7 gun crime actually went up in the UK. All it did was rob a large section of the population of a hobby, all but prohibit UK participation in several Olympic disciplines and cost the tax payer over 150,000,000 pounds. All the while criminals have never had so much access to firearms. The UK and the US are 2 very different places. Using the Dunblane story as an example of success is an example not of political art……..it’s “Fake Art”……..